Cinnamon and Gunpowder gave me the same warm, fuzzy feelings I experienced with The Long Way to a Small Angry Planet by Becky Chambers. Now, I’ll grant you that the former is historical fiction set on a pirate ship and the latter is sci-fi set on a drilling rig in deep space, so they’re perhaps not the most obvious pairing. 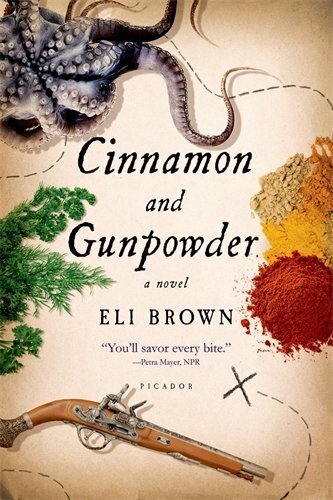 But as I reflected on the things I liked about Cinnamon and Gunpowder in preparation for writing about it here, Chambers’ book kept bobbing to the surface of my mind. The settings, characters, and plots may be different, but the glowy heart feeling upon turning the last page is the same. Another similarity the books share is that they are narrated through the eyes of a newcomer aboard, and both central characters have some preconceived notions to reevaluate as they get to know their new homes. Owen is captured and forced to use his talents as a chef to benefit Captain Hannah Mabbot, which he takes issue with considering she murdered his boss, a man Owen greatly respected. It turns out, though, that despite Owen’s total confidence in his rightness on literally everything, life on the high seas might change his perspective. Pirates, romance, gourmet meals, swashbuckling! Cinnamon and Gunpowder really has it all.